So, the wife and I are in Harrisonburg, VA. She's here to do some work, you know, the kind that pays you money. She's going to be one of the voices on Rosetta Stone's new Hindi computer program. Me...well, I'm tagging along for a few days, getting out of the hustle of New York...I traded it for the hustle of Harrisonburg, VA. Except. There's no hustle. No hustle at all. And no bustle either. It's sorta nice. There's not much to do...except shop. Eat. Walk around...where people say hello to you. And smile. Well, I think it's smiling, it's what I remember smiling to look like. I'm pretty sure it's smiling. One of the things we did when we got here was drive over to Monticello, the home of one Thomas Jefferson. That guy. You know...writer, scientist, President, all around smart guy...when did we stop electing those types? It was a beautiful drive over...winding through some small mountains, great views. Monticello is...not what I expected. I thought it would be bigger. Well, the estate itself is big. But the house...is smaller than what I thought. The rooms aren't that big and they open up into each other, few hallways, it's room, room, room. Gorgeous, luscious rooms with views and light, but still...they aren't the mansions that we see today. Still. Just to imagine that Jefferson and who knows who else walked these rooms, sat in that chair, died in that bed...Jefferson...who wrote the Declaration of Independence. This was truly a Founding Father...someone who really thought about Government, Freedom, what is is to be an American. I don't know if any of you have been watching the John Adams mini-series on HBO, I haven't, but I caught the last episode here in the hotel. 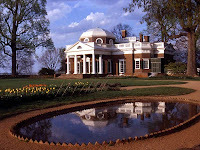 Now, SPOILER ALERT, when Adams and Jefferson DIE...bet you didn't know they died...they use Monticello. Clearly. It was so strange for me to see...the actor playing Jefferson, walking around the office and library...the same one the day before where I wasn't allowed to touch things. It was kinda cool. And a bit of trivia. John Adams and Jefferson died the same day, the 4th of July on the 50th anniversary of the signing of the Declaration of Independence.